The EA288 engine series appeared in 2012. It also is named as the modular platform of diesel engines (MDB - Modularer Dieselbaukasten). The EA288 includes the 2.0 TDI and three-cylinder 1.4 TDI engines. The 1.6-liter TDI engine inherited the main cylinder block dimensions for the EA189 engine such as stroke, cylinder bore and bore spacing. All 1.6 TDI engines don't have balancer shafts. Compare to the 2.0-liter version the bore is smaller by 1.5 mm and stroke by 15 mm. Crankshafts has five main bearings and four counterweights only for reducing loads. The crankshaft drives the oil pump by its free-maintained belt, and belt operates in oil engine directly. There is aluminum 16-valve double overhead camshaft cylinder head. Timing belt drives exhaust camshaft, and the intake camshaft drives by gear from exhaust camshaft at the rear end of the engine. This valvetrain layout is used in all EA189 engines. Timing belt drives the high-pressure fuel pump also. 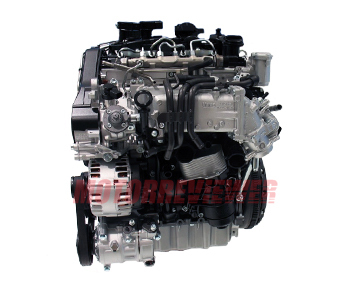 The engine has Common Rail direct fuel injection system. The engine got electronically regulated turbocharger integrated into the cast iron exhaust manifold. The engine can keep the optimal air boost at all revs. The high-pressure air goes through a water-cooled intercooler, which integrated into the intake manifold. The engine got oxidation catalytic converter, diesel particulate filter, and dual-loop EGR system. The main problem is a diesel particulate filter which very sensitive to the quality of fuel. This filter is pretty expensive, but this is a price for low emissions.